The agreement is going to be a key factor in helping India achieve its nuclear energy targets. The civil nuclear deal inked on Friday by India and Japan would have a significant bearing on the progress of the two atomic projects currently under discussion involving American nuclear vendors — GE-Hitachi and Toshiba-Westinghouse. The Agreement for Cooperation in Peaceful Uses of Nuclear Energy signed by the two sides is set to be a crucial determining factor as the two US-based reactor vendors, as well as a range of other global nuclear reactor manufacturers that have alliances with Japanese companies and source the most critical equipment in a reactor — the calandria or reactor vessel — from Japanese heavy forging major Japan Steel Works (JSW). 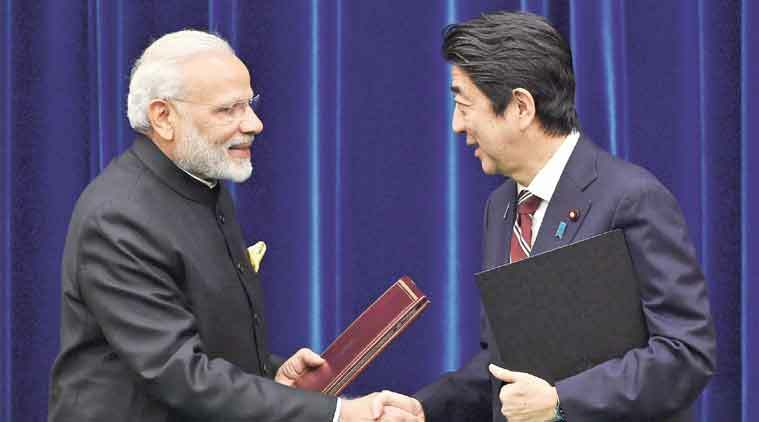 The deal, concluded after more than six years of negotiations began in June 2010, marks a fundamental shift in Japan’s policy as India is the first non-NPT signatory with which Tokyo now has a nuclear pact. The first project to leverage the benefits of the deal will be a Light Water Reactor-based project slated to be set up by US nuclear vendor Westinghouse Electric, which is working on plans to deploy six atomic reactors units in India in a pact with state-owned Nuclear Power Corporation of India Ltd (NPCIL). For this, the Toshiba Corp-owned American reactor firm is expected to put out a revised techno-commercial proposal shortly. With the Japan pact now through and assuming that negotiations proceed on schedule, the commercial contract for this deal should be signed by June 2017, officials involved in the exercise said. The site design and engineering work is expected to start immediately for the project that has been relocated to Andhra Pradesh and will deploy Westinghouse’s new AP1000 reactors. Each of these “third-generation” reactors has a capacity of 1,150 megawatt electric (Mwe). Globally, apart from Japan’s JSW, there are just three major heavy forging capacities in operation worldwide that can fabricate large single-piece pressure vessels for nuclear reactors — Creusot Forge (a subsidiary of France’s Areva group), Russia’s OMZ Izhora and Chinese state-owned firm China First Heavy Industries. But JSW dominates the nuclear forgings business, accounting for an estimated 80 per cent of the world market for large forged components for nuclear plants and owns the world’s only plant capable of producing the central part of a large-size reactor’s containment vessel in a single piece from a 600-tonne ingot, which reduces radiation risk. All the global suppliers are booked with orders for at least the next several years as the most critical issue for accelerating nuclear power plant construction is the availability of heavy engineering plants to make the reactor components, especially for units of over 1,000 MWe. While Toshiba-Westinghouse’s AP1000 pressure vessel closure head and three complex steam generator parts can only be made by JSW, the Japanese firm has advance orders from GE-Hitachi for fabricating components for its ABWR and ESBWR range of boiling water reactors. JSW had also supplied the pressure vessels for Areva’s first two 1650 MWe EPR projects in Finland and France. Vendors prefer large forgings to be integral, as single products, but it is possible to use split forgings that are welded together. These welds then need checking through the life of the plant. An NPCIL official said the process of bridging the difference over the substantive issues on the proposed India-Japan nuclear agreement in on and that both countries had made significant progress in the negotiations on civil nuclear cooperation. JSW had set up a marketing office in India in 2009 through a subsidiary — JSW India Pvt Ltd. The Japan deal is being seen as a boost to India’s strategy to pursue a low-carbon growth model in decades to come, formally enunciated in the Intended Nationally Determined Contribution announced at COP-21 in Paris late last year and ratified by the government on October 2, now being translated into an actionable working plan. Alongside a concerted push for solar and wind energy capacities, a detailed plan to augment the investment in the nuclear power generation sector spanning the next 15 years is being prepared by the Department of Atomic Energy. Alongside the addition of second 1,000-MWe Kudankulam nuclear power unit (built with Russian assistance) to India’s national grid in August this year, which increased the country’s installed nuclear power capacity to 6,780MWe, nine more reactors that are at various stages of implementation are expected to add an additional 6,700 MWe capacity over the next seven years. According to the plan, before March 2017, commencement of work is planned on 16 new reactors with a total capacity of 16,100 MWe, including eight indigenous PHWRs of 700 MWe each with a total capacity of 5,600 MWe and eight LWRs based on international cooperation — with Russia, France and the US — totaling to a capacity of 10,500 MWe. Finalisation of these projects, a senior official indicated, is being pursued with “due attention to cost, technology adaptation and safety”. For stepping up the nuclear capacity, there are three key enablers. The pact with Japan would be a major step in this direction, especially in getting access to key suppliers such as JSW. Secondly, by the end of this calendar, nearly 3,000 metric tonnes (MT) of nuclear fuel is likely to be shipped into India from three countries — the Russian Federation, Canada and the Republic of Kazakhstan. The uranium shipments expected in 2016 is likely to be a record for a single year and would, in quantitative terms, amount to nearly 53 per cent of total nuclear fuel imported into India since the country’s access to the global nuclear fuel market opened up in 2008. Thirdly, the Indian Nuclear Insurance Pool, launched by the state-owned General Insurance Corporation-Reinsurer (GIC-Re) and other Indian insurance companies in June last year to offer an insurance product for NPCIL for covering the operator’s liability under the provisions of the Civil Liability for Nuclear Damage (CLND) Act 2010, will subsequently launch a separate product to specifically cover the risks of the suppliers under this Act — something that was being seen as crucial to foster investor interest among suppliers, both domestic and foreign, in the sector.